Canada? Why should we leave America to visit America Junior? The Kev and I just returned from Canada, where we did a little bit of everything from Formula One to whale-watching. We spent most of our holiday outside, and have the rosy cheeks to prove it! We started in Montreal, then went to Quebec City, and finally a huge loop up to Tadoussac and down through the Cantons de l’Est. 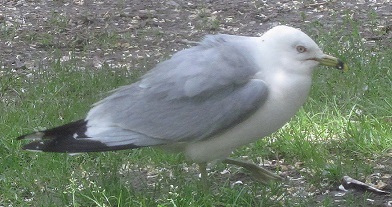 Even though we were in francophone Quebec, there are still many reminders of Britain, such as this seagull doing a creditable Winston Churchill imitation. And of course, U.S. culture makes its appearance, being on the same continent and all. I learned two things about myself on the trip. Thing one, despite years of French instruction, I can’t speak it to save my dang life. Thing two, I never stop taking DIY notes! I took lots and lots of pictures of Quebecois exteriors and could have taken lots and lots more. The first thing I noticed is that Montreal gardens are gorgeous! They make the most of a short growing season, using the “Parks” and “Explorer” roses (love ‘em) and lots of hardy natives. 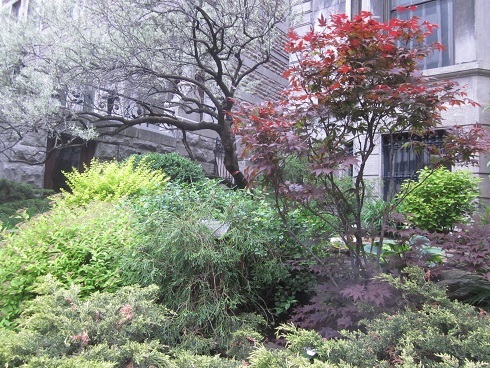 Beautiful composition – colors, shapes, textures, all fantastic, right in downtown. 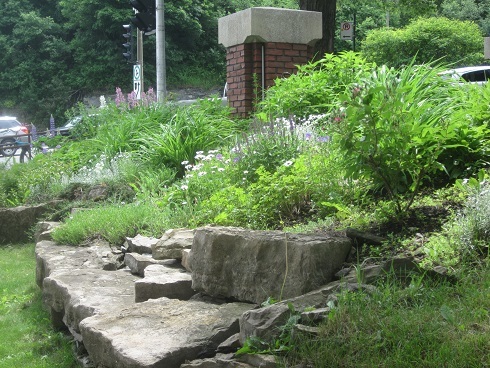 Love the plantings tumbling over the rocks. The houses themselves are also full of character and ideas. With the long, snowy winters, metal is the roofing material of choice. From Chateau Frontenac’s famous copper to zinc and coated steel, metal roofing was much more prevalent than in our current or former neighbourhoods. Since we’re creeping up on a re-roof ourselves, I paid close attention. Metal roofs are hardy and long-lasting. Perhaps not in red, though. 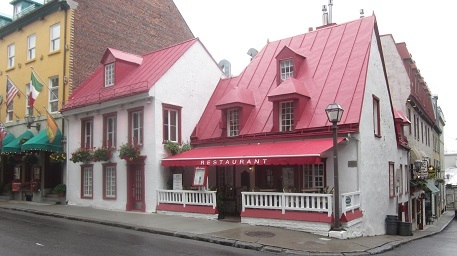 Some homes in the historic districts (and we’re talking European-level historic here – Quebec includes an extant walled city, and both Montreal and Quebec boast districts dating to the 1600s) have metal shingles set at an angle. I don’t know if this is functional (to shed snow, for instance) or simply decorative, but it’s very cool. I only have one picture that shows this feature in detail. 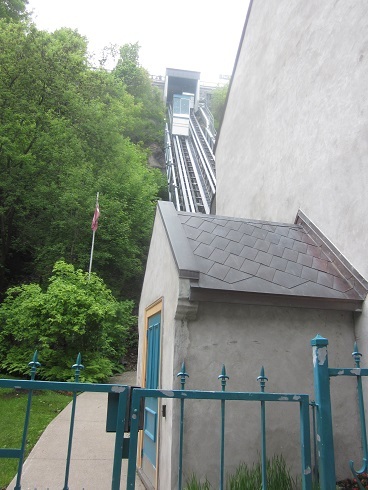 Angled shingles, funicular station, Vieux Quebec. I doubt we could find a roofer willing to do this in decidedly un-French Minnesota, but it is definitely eye-catching. 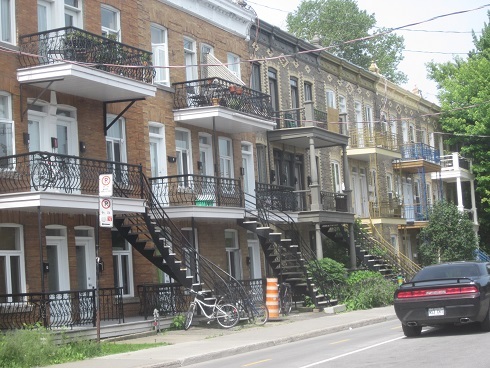 Montreal features many homes with exterior iron staircases, allowing upper-storey residents a separate entrance. These stairs are so distinctive that they were chosen as an emblem of the city over the Olympic Stadium. Having lived above the ground floor with both interior and exterior stairs, I personally prefer interior. I remember many a drizzle-induced misstep on our outside stairs in East London; with snow and ice, I probably would have broken an ankle! But there’s no denying it was nice to have our own entrance, and it’s hard to fault an architectural feature as pretty as Montreal’s iron steps. Despite spending so much time out and about, I did have occasion to take one relevant interior shot. 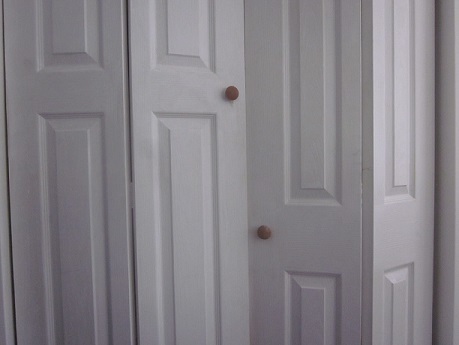 Remember my quandary about bifold closet door handle placement? I had not considered this option, selected by one of our temporary landlords. I’m still not considering this option. But I am considering a quick return to lovely Quebec. This entry was posted in Siding & Roof, Yard & Garden and tagged montreal, quebec. Bookmark the permalink. 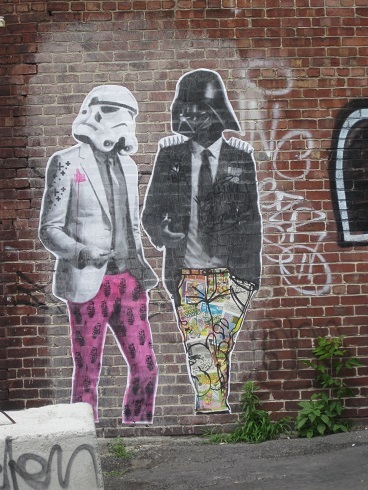 I love the blog!!! I finally had time to sit with a cuppa and gorge myself on page after page. However, I’m a little concerned about the dual nature of some of your cookware. Is there going to be a rustoleum coated pot roast in your future?